Sony Xperia Z Ultra was officially launched in India today with a price tag of Rs. 46,990 . We covered the listing of this phone on Saholic last week along with its Quick review. With a massive 6.4 inch display size and powerful Snapdragon 800 processor, this water resist smartphone stands apart from other phones and is alone in its category. Sony Xperia Z Ultra is the first smartphone which comes with a 2.2 GHz Quad core Qualcomm Snapdragon 800 processor, which needless to say, will cater to your graphic intensive gaming needs without any lag. The operating system employed is Android 4.2 Jelly Bean. Sony recently announced a list of devices which will get upgraded to latest Android 4.3 O.S. and this phone being on the list is expected to get the upgrade pretty soon. The RAM capacity is 2GB will ensure efficient multi tasking and lag free gaming. Internal storage memory is 16 GB which can be further extended to 64 GB using a microSD card. The camera features of this are less than what we expect from Sony flagship Smartphone. This device features an 8MP primary camera with 3264 x2448 pixels and without LED flash, which will be a big hindrance to low light photography. Camera features include image stabilization HDR, touch focus, geo tagging and Face detection and it is capable of Full HD video recording. A front camera of 2MP is also present which is also capable of full HD video calling. The battery capacity of 3050 mAh will give you talk time of up to 16 hours on 2G and 14 Hrs on 3G and a standby time of up to 820 hrs. Battery capacity is well matched for extensive usage and large size FHD display. Connectivity features include GPRS, EDGE, Wi-Fi, Wi-Fi hotspot, Wi-Fi direct, Bluetooth 4.0, NFC and micro USB with MHL support. This phone IP58 and IP55 certified which implies it is dust proof and water resistant up to 1 m depth for up to 30 minutes. You can also use it to click photographs and shoot videos under water. At 6.5 mm thickness this phone will be comfortable to hold considering its large size. Those of you interested in large screen Android phones will surely love it. 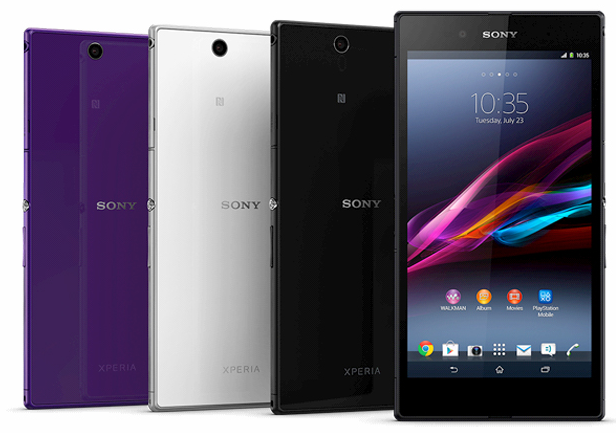 Sony Xperia Z Ultra has been priced at Rs. 44,990 on Saholic. you will also get a 16GB microSD card free with this device.